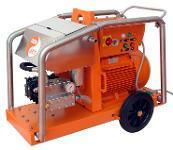 DEN-JET produces a wide range of Water Jetting Equipment. With research & development facilities, heavy in-house CNC machining capability and a full manufacturing facility in Denmark we handle the business from idea to end user support. We control logistics, support our own assembly plants in Europe and Asia as well as a network of distributors worldwide. We have grown rapidly during the past decade and were in 2009 granted the Gazelle award for being no 72 best performing company in Denmark out of 4000 super performers. In Singapore we received the outstanding Enterprise 2011 award and in 2012 the platinum award for promising SME 2012. Our range of products covers complete electrical, diesel, petrol, hydraulic and air-powered Water Blasters from 100-3000Bar for the Industrial, Marine and Offshore markets. 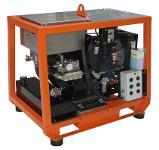 We produce a range of pumps, power packs (motor-pump units and engine-pump units) and Water Jetting Accessories for the OEM market and stock substantially in all our locations in Denmark, Singapore and China from where we support our customers along with a continuous growing distributor network. 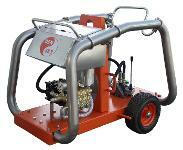 We are a team with more than 25 years of experience in developing and manufacturing Water Jetting Equipment in both Asia and Europe. We have a thorough knowledge about what pays off to manufacture in Asia and Europe both in terms of quality and cost. With a load full of mistakes in the past we have refined our decisions in order to obtain best quality/cost. Precision parts have become our strength in Northern Europe with many castings from Southern Europe and most metal plate and pipe fabrication done in Asia. We know both our own and competitors’ products very well, our support and sales engineers have emphasized on in-field experience making us understand most application well.In terms of maintenance our key word is Visual Fault Finding meaning that we have installed gadgets to identify the fault visually and we do not dismantle before we have identified the cause of the problem. 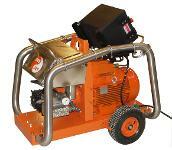 We look forward to support you no matter what Water Jetting Equipment you deal with. We often stay in daily direct contact with distributors in order to obtain market response, create special solutions or provide technical/sales support. We are dedicated to educate our team in order to provide a sustainable support for the customers dealing with our products now and in the future. 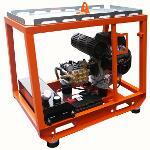 Being a part of Den-Jet means a continuous aim for better products.